No golf tournament is complete without the excitement of a hole in one contest! Hole In One Insurance Coverage allows golfers the chance to win big prizes, should they make a hole in one on one of the designated holes. And this is also an excellent opportunity to sell the Hole In One promotion as a sponsorship opportunity for tournaments and additional revenue for whomever you are supporting! See how hole in one contest prize insurance works and learn why American Hole ‘n One is the leading provider of hole in one insurance coverage. Provide the number of golfers that will participate in your tournament. Select the par 3 hole(s) and yardage for the main prize hole in one. Determine the cash value of your main prize. Your prize is covered with Hole In One Contest Insurance and your hole in one sign sponsorship package will be delivered to the golf course or other preferred address. American Hole ‘n One offers all-inclusive Hole In One Insurance Coverage packages with free shipping. Pricing varies based on 3 key factors: number of eligible players, distance of the shot (in yards), and the cash value of your main hole in one prize. Need more information about our Hole In One Contest Insurance? Call (800) 822-2257 to speak with a Golf Excitement Specialist now! Hole In One Insurance allows event organizers to advertise amazing grand prizes for their hole in one contest, without the hefty price tag. For just a small fee, American Hole ‘n One will assume all of the financial and legal risks associated with running the event’s contest. This way, you can offer bigger and better prizes, while attracting event attendees, sponsors, and contestants in order to make your next tournament a huge success. Golfers will be extremely motivated to participate in your hole in one contest with big prizes like exotic vacations, trips for two, big cash prizes, tickets to the Masters, golf equipment, and even cars and boats! You can even create a customized package that includes a few different prizes, like a trip for two with a shopping spree, depending on your unique needs. The possibilities are endless to what you can offer participants and with golf insurance from American Hole ‘n One, giving away big prizes is simple, affordable, and risk free. With a hole in one contest, you’ll create visibility for your sponsors, attract more participants to your tournament, and create a memorable event that’s sure to be talked about for years to come. Our team of professionally trained Golf Excitement Specialists will walk you through the most comprehensive Hole In One Contest Insurance program in just minutes. Simply give us a call or request a quote online. No Hole In One Contest is complete without high-quality event signage that promotes your sponsors, guides golfers throughout the course, and advertises your hole in one contest. 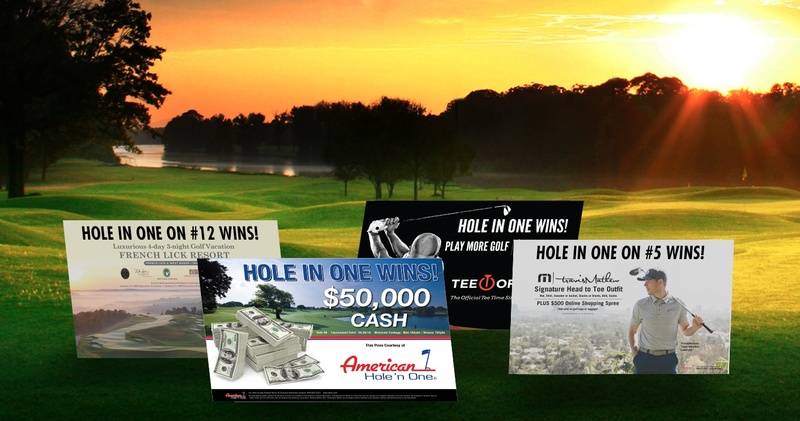 American Hole ‘n One has a state of the art signage facility to help you create custom golf signs, banners, and over-sized presentation checks to make your golf tournament and hole in one contest look professional. We offer a number of different packages with fast turnaround times and durable materials to meet your needs. Create a lasting impression on sponsors, event attendees and golfers alike with professional golf event and tournament sponsor signage. Why Choose American Hole ‘n One? For over thirty years, American Hole ‘n One has been the leading provider of hole in one insurance. We are highly dedicated to providing the best customer service experience possible and seek to assist our clients in accomplishing their unique goals. From exceptional service to high-quality event signage, we’re proud to offer the very best in the prize indemnity business. To help guide you through the process and create a contest that’s sure to wow, our Golf Excitement Specialists are available 24-hours a day and will provide you with the personalized attention you deserve. For your peace of mind, we are underwritten by A+ rated Great American Insurance Group. Plus, we offer automatic coverage for multiple winners at no additional cost. 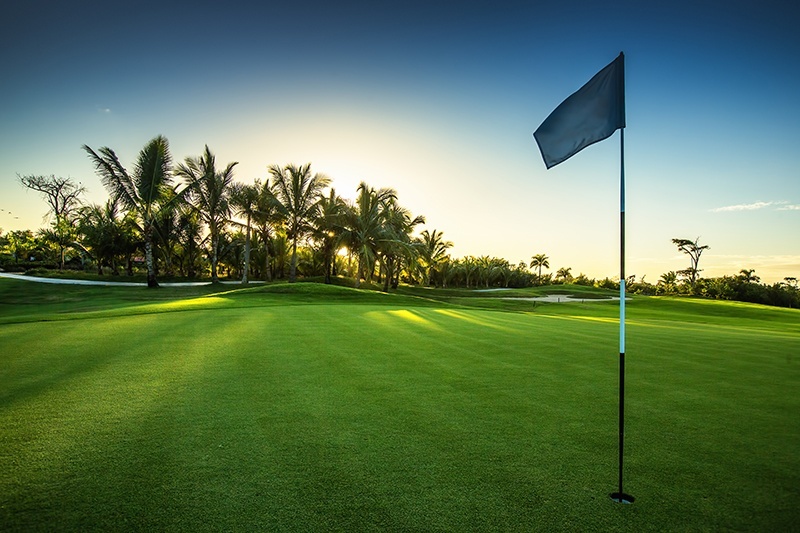 Trust American Hole ‘n One to provide you with comprehensive Hole in One insurance coverage and to create a memorable event that’s sure to impress.